I spent part of the Easter holidays in beautiful Edinburgh attending the annual IAML (pronounced Yam-ull, rhymes with camel) Annual Study Weekend. 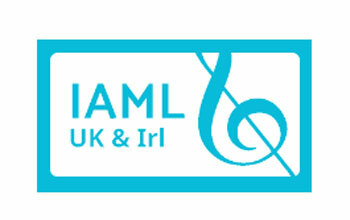 The UK and Ireland branch of the International Association of Music Libraries, Archives and Documentation Centres (Archives and Documentation Centres were added to make the title more inclusive in 1980, hence the earlier abbreviated acronym) has run conferences along with its AGM on an occasional basis as early as 1956, with the ASWs becoming a regular fixture since at least 1972. So what do music librarians talk about when they get together? Here are a few of the highlights. We were a mix of librarians from different backgrounds - there were librarians from most of the Legal Deposit libraries, from academic, public and independent libraries, and private collections. Many of the librarians worked in conservatoires. We had a wide experience of music librarianship, and an equally wide range of musical tastes. Where else would you find an antiquarian music seller, a former sound engineer, who'd worked with the Spice Girls, and a bagpiper, all happily chatting in the same room? The Study Weekend opened with a fascinating look (at least for us librarians) at copyright in a digital environment. This looked at most of the common digital environments from e-journals to webpages, e-books and e-legal deposit; and some misconceptions around what you can and can't copy. Later that evening we admired the work of Katharine Hogg and Colin Coleman from the Foundling Museum. Katharine and Colin are best known for their work in the Gerald Coke Handel Collection, more recently though they've been engaged on another project - transcribing Ralph Vaughan Williams' letters. There was a gasp from the assembled librarians, Vaughan Williams' handwriting is notoriously illegible! Many of the letters, as you might expect, were about music, but there were also letters about politics, and Vaughan Williams' work with refugees. There were also some surprises - VW's cat, Zebedee, proved to be an engaging occasional correspondent, even if he did need an amanuensis. It's important to note that Vaughan Williams, in common with Sir Arthur Bliss, was not a diarist, so the correspondence is vital in fleshing out the story of his life. There were talks on issues around cataloguing special collections (musicians will not be surprised that music ranks as a special collection), small scale digitisation projects, research funding, and the Newcastle "Lit and Phil" as previously mentioned on MusiCB3. On the Saturday morning, Megan Dyson of Leeds College of Music, spoke about the "hybrid" music library. Megan looked into user format preferences at Leeds College of Music, and then compared what readers said they wanted against what they actually used. I found this particularly interesting, not least because some of it correlated with experiences and discussions I have had with readers at the UL. It certainly prompted me to think more fully about some of the issues raised. You can see the slides from Megan's talk here. It was a weekend of networking, laughter, music, and IAML's very own version of speed dating - the Quick fire round. A sort of musical chairs for librarians with short talks on various subjects from the latest on General Data Protection Legislation (there were queues!) to volunteering for IAML, distance learning, looking after performance sets, and cataloguing antiquarian music. For more information on the conference, see IAML's live Twitter feed, and watch out for posts on the IAML blog over the next few weeks. An overview of the Edinburgh ASW - reblogged from MusiCB3, the blog of Cambridge University Library Music Department.